You can’t avoid tornadoes, but planning can help you recover. 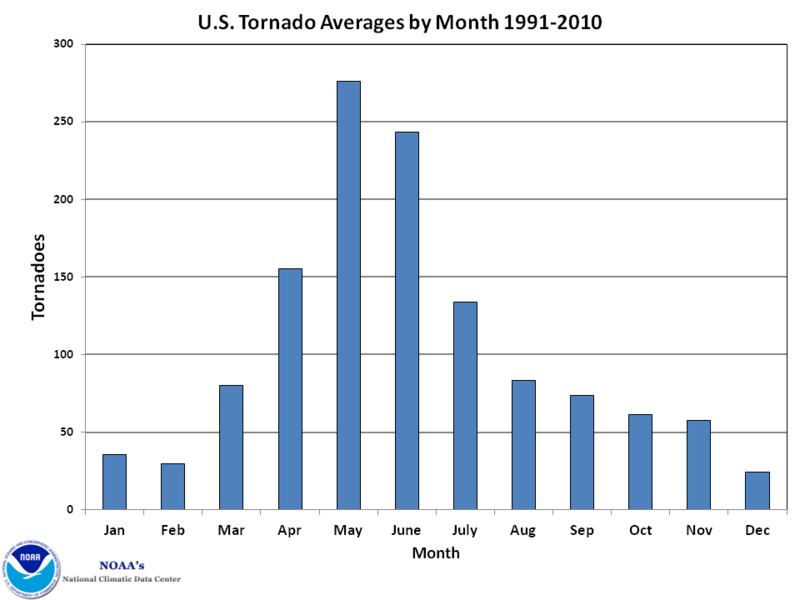 While tornadoes can occur throughout the year, spring and early summer are peak months in most of the United States. Prepare to respond to a tornado by stocking your emergency kit, updating your family’s emergency communication plan and checking your insurance coverage. “Tornado Alley” in the southern Plains states has a statistically higher tornado occurrence, but National Climatic Data Center records show tornadoes can happen in any state. While there is nothing you can do to prevent a tornado, there is much you can do to prepare your family for recovery from a tornado. Think about your home, school, place of worship or other locations where family members are likely to spend time, and discuss a safe location where you might go for shelter in those locations. The Federal Emergency Management Agency (FEMA) tornado preparedness website advises that you go to a pre-designated shelter area such as a safe room, basement, storm cellar or the lowest building level. If there is no basement, go to the center of an interior room on the lowest level (closet, interior hallway) away from corners, windows, doors, and outside walls. Put as many walls as possible between you and the outside. Get under a sturdy table and use your arms to protect your head and neck. Ready.gov also urges all families to assemble a disaster preparedness kit and to create a family communication plan. FEMA recommends you assemble a supply kit that includes three days of food and water for each member of your household. You can assemble one yourself or purchase pre-assembled kits in storage buckets from your local shopping club. Store the items in your designated household safe location for immediate access in an emergency. Ready.gov offers a complete list of items to include in your emergency kit. And when assembling your kit, remember to plan for your household pets. Because your family may not be together when disaster strikes, FEMA recommends that you create contact cards for adult family members to keep in your wallet or purse. Put copies in each child’s backpack or book bag, too. Designate an out-of-town friend or relative to act as a contact point. If your family is separated, have family members check in with your contact person using a cell phone or prepaid calling card. Families who text may find that text messages can get through when a cell phone or landline calls cannot. Finally, if you have questions about your coverage, check with your agent BEFORE a disaster strikes. Your JF Insurance agent can review your coverage and make sure you don’t have costly gaps in the event of a loss. You can’t stop a tornado, but having the plan and the supplies you need can make recovery easier.